Sanata escardufá » Blog Archive » Übermeaty Omnipark? The following newstory appeared in the last edition of the magazine of the Omnipark shopping centre. The article (click on the image to get it full size) gives quite a biased and unsupported view on the reasons to eat meat. That’s why I sent a letter to their costumer service (see after the image), for which unfortunately I have received no answer whatsoever. 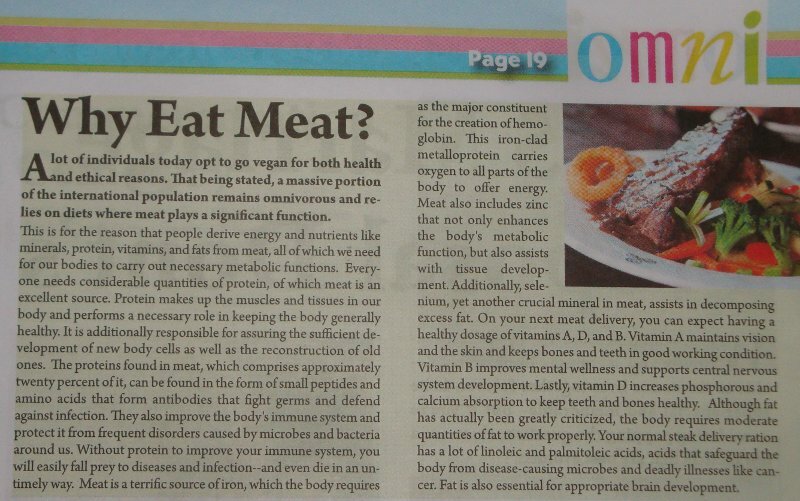 Not without surprise I read the article “Why eat meat?” in your magazine. The article gives an overview of the different nutrients present in meat, giving the impression to the reader that this be the only source of such nutrients. However, there is scientific proof nowadays that a person following a balanced vegetarian diet would get all those nutrients . This is not the statement of any vegetarian organisation, but the conclusion of a comprehensive review of the state-of-the-art in the topic carried out by the dietetic associations of the US and Canada. Moreover, there is clear evidence nowadays that the regular consumption of red meat (“your normal steak delivery” in the article) has negative effect on health (higher mortality risk) . I’m surprised that an article that deals with the reasons to eat (or not) meat does not cover this issue, as it is of paramount relevance to the topic. This entry was posted on Thursday, October 4th, 2012 at 8.47 pm	and is filed under Opinion, Veg(etari)anism. You can follow any responses to this entry through the RSS 2.0 feed. You can leave a response, or trackback from your own site.